Sie sind hier: Home » Postkarten - Postcards » A diver goes to a sh..
Datum / ÄRA: Postkarte, veröffentlicht um 1945. Feeding Time at Marine Studio - On Fla. Rte. 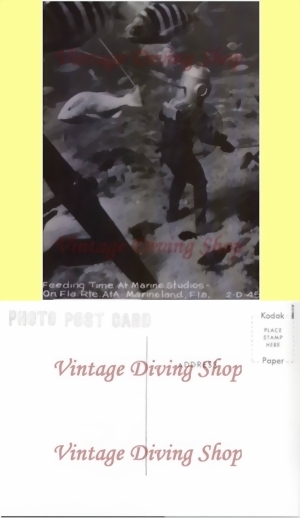 original titles: "A diver goes to a shallow water diving helmet"
date / ERA: Reproduktion from an orginal 1945 print. An old classic historical Postcard, new reproduced.